Traditionally, crochet was always a finely worked craft, using mainly white and cream threads to produce a cheap alternative to lace, while contemporary practice means that we can work with a myriad of different hook sizes, yarn weights, fibres and colours. I personally love the versatility of crochet today, but I also adore the delicacy, intricacy and beauty of traditional crochet threadwork. 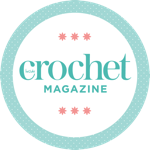 This issue, we celebrate the innate lacy quality of crochet to create some stunning summer projects. Our designers have taken conventional crochet cottons, their modern alternatives and some heavier weight yarns to create their own, modern spin on traditional lace techniques. Inspired by filet crochet, Irish crochet and other threadwork techniques, the projects have all taken very different directions, some close to their vintage counterparts, others containing only a hint of the time-honoured practices. Jennifer Reid’s stunning Rosen top, our cover project, combines a very modern, wearable shape with the very traditional fi let lace technique. Updating the fabric with slightly heavier yarn, moving away from the traditional cotton thread and using a larger hook than would usually have been used all help to modernise and refresh this gorgeous craft. The colour is still neutral, as conventional filet lace would have been, but soft neutrals and bright whites are bang on trend for this summer, so when you wear this comfortable, flattering piece you can be sure you are making a statement while honouring the timeless traditions of our favourite craft.